Many years ago our gregarious and intrepid sale rep from Ropak, Gordie Webb presented a video at one of our Manager’s meetings titled Give em the Pickle. The creator of this video (yes it was video as DVD was not around at that time) was Bob Farrell founder of Farrell’s Ice Cream Parlours in Seattle, Washington. The premise was about giving a little extra to each customer and they’ll tell ten friends how well they were treated vs. the hundreds they’ll tell when they are treated poorly. This video (now DVD) has been shown numerous times to our staff and is always part of a new sales or customer service employee’s training. People in our company are encouraged to “Give em the Pickle” whenever they can. 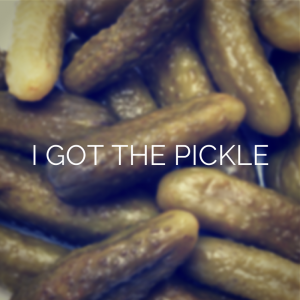 Here is a Pickle story I have told many and will continue to tell for years. I’ll never forget the day I got a Pickle from a customer service rep at Westjet. Being a frequent business traveler, I am quite comfortable with the logistics and requirements of air travel. Usually I am very prepared, on time and booked well in advance. Back on June 22, 2006 I had just arrived at the Calgary airport for a 6:30 AM flight to Winnipeg. Much to my horror upon pulling into the airport parking lot at 5:20 AM, I realized I had left my wallet at home. After uttering some colourful language, I realized there was no way I was going to make it home (35 minutes without traffic) and back to the airport in time for my flight. I went directly to the Westjet counter to advise the friendly, smiling representative at the counter. “Good morning sir and how are you today” she enquired. “Not so good I’m afraid, I left my wallet at home and have a flight to Winnipeg in one hour” I replied. We talked back and forth about the possibility of me getting on the flight without picture ID but I needed my credit cards and ID for rental cars and hotels so I had no option but to change flights. Realizing how bad a morning I was having this wonderful lady proceeded to book me on the next flight without charging me the standard $30.00 change fee for which I thanked her very much. Once all the paper work was done and I was ready to get back on the road home to get my wallet she pulled a twoonie ($2.00 Canadian dollars for our American readers) out of her pocket and handed it to me. To say the least I was a little confused and surprised. She simply smiled and said “go get yourself a coffee for the ride home and I hope your day gets better”. Well, it sure did from that moment forward. The power of her actions will never be fully realized by her and I feel terrible for not knowing her name. Westjet is known for their exceptional customer service and has won many awards for their ability to “Give em the Pickle”. This wonderful lady was simply doing what her company encourages her to do by going above and beyond to offer the customer an experience they will want to repeat over and over again. I will tell this story for years to come and will incorporate it into training seminars and new employee orientations thereby sharing this story with hundreds if not thousands of people. All because of one simple gesture and an incredible amount of empathy, I will be a loyal Westjet customer for the rest of my life.